This article is about the TCG Booster Pack. 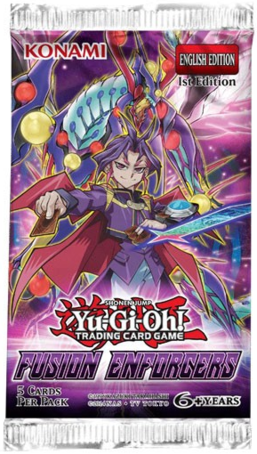 For the OCG Booster Pack, see Booster SP: Fusion Enforcers. Fusion Enforcers is a Booster Pack in the Yu-Gi-Oh! Trading Card Game (TCG). Includes cards used by Sora Perse and Yuri. Includes members/support for the "Edge Imp", "Fluffal", "Frightfur", "Fusion", "Performapal" and "Polymerization" archetypes. Introduces the "Invoked" archetype to the TCG. Introduces the first support for the "Predap" and "Predaplant" archetypes to the TCG. This page was last edited on 18 March 2019, at 03:14.